When installing a new heating system, you are probably more concerned with the choice of furnace than of the fuel storage tank. Maintenance, insurance and replacement issues of the heating system probably have you focused on the furnace, too. If you have an oil furnace, the tank can be a major cause of unnecessary hidden costs. If you inherited an oil tank when you bought your house, you certainly need to get the tank assessed to establish a baseline. Here is our checklist of oil tank issues that will help you improve safety and bring down the costs of your oil-fired heating system. We can help you get your oil tank working efficiently. If you're new to oil furnaces, you probably won't know the size of the tank you need. If you already have a tank, you may not realize whether or not it is the right size. The crucial factors when deciding appropriate oil tank sizes are consumption rate and reliability of supply. Your oil tank installation issues might have dictated the size of the tank rather than supply needs. For example, a tank that is too small can result in the furnace running dry, which is damaging to the equipment and can leave your family freezing through the night. Establishing a reliable supply contract, then, is crucial to allowing you to run off a smaller tank. Regular maintenance will avoid the chance of wasted fuel. As a rule of thumb, you need to ensure that your tank is always at least a quarter full. Speak to our HVAC specialists at Smart Click Energy, to get a reliable supply contract and expert advice on oil tank dimensions. All issues around oil tanks have different priorities depending on the type of tank you are dealing with. There are plastic oil tanks, steel tanks, indoor tanks, outdoor tanks and underground tanks. You can also choose between a single-skin, double skin or integrally bunded tanks. A bunded tank means one tank sitting inside another, with the outside tank being 10% larger than the inner tank. This is another example of a task you need expert help for. The type of tank you have greatly influences the maintenance tasks you need to perform. However, the basic principle is to ensure that the oil flows freely though the outlet pipe and nowhere else. Check the tank legs and make sure they are not missing, rusted, buckled or bent. Make sure the leg brackets are not cracked or coming away from the tank. Check the platform of the tank to ensure it isn't cracked or deformed. Look for rust on metal tanks. Run your hands over the tank and connectors to detect warps, dents, weeping or wet spots. Check around the drain. If the tank is blackened you may have water leaking into it. Check the pipes that connect to the tank for drips or dampness. Do the same for filters and valves. Make sure the vent whistle is working. It should sound when the tank is being filled. Check that the oil tank gauge is working by checking its levels as you use up the oil. Look to see whether the gauge is cracked or loose. Make sure an outdoor tank is protected from strong winds and falling ice or snow. Check nearby trees so that branches are not likely to fall on the tank. Ensure that the tank sides are fenced off so lines and filters can't get run over by a mower. Check that the screens on the vents are not corroded, clogged, broken or missing. A buried tank is harder to check. In these cases you would be better off taking out a maintenance contract with a specialist heating oil company. Although above-ground tanks are easier to check, getting them checked regularly by maintenance specialists will reassure you that nothing has been overlooked. Preventative maintenance may seem a cost burden. However, it will help extend the operating life of your tank. Oil tank repair is costly and often only a short-term solution. Oil tank prices are high, and buying a new one will be costly. Test and maintain your oil tank regularly to avoid the high cost of oil tank failure. The oil tank is a component of a wider heating system. Checking flow rates and identifying blockages is a task that needs to be carried out on your entire heating system, not just the oil tank in isolation. You should get a full, professional inspection of your heating system at least once a year. The ideal time for testing is before the start of the cold period when you will need heating. This strategy ensures safety and efficient operations. Locate an experienced engineer who can verify your system. Few insurance companies issue oil tank insurance policies. An improperly maintained oil tank can be cited by insurance companies as a reason not to pay out on household insurance in the event of fire or poisoning. A leaky outdoor oil tank can cause environmental damage, which insurance companies will not cover. An oil leak would ruin your backyard. You would need to go to the heavy expense of having all the soil removed from your property and replaced. Oil-soaked dirt is expensive to dispose of. If your leak damages other people's property or public land, you could be facing legal costs and fines as well as the cost of repairing the damage. Your best insurance policy is to take out a maintenance contract with an established firm of heating engineers. You might think that oil tanks need cleaning out because of some sort of tar buildup. Actually, it is not the thick pollutants you need to look out for, but the weak ones. Condensation forms on the inside of tanks, and the resulting water gets trapped. Water builds up at the bottom of the tank — remember: Oil floats on water. Oil tank cleaning is necessary to remove this problem. The result of this water is that a metal tank will corrode from the inside out. Tank corrosion is an obvious cause of leaks. The mix of water, rust and oil will create a sludge in the bottom of the tank. The oxidized metal and water can also be drawn into the outlet pipe and mixed in with the fuel supply to your furnace. Oil contamination will damage you furnace and create blockages in filters and valves, increasing maintenance and repair costs. For these reason it is important to get your tank cleaned out periodically. Experts recommend having your oil tank cleaned out at least once every five years. This is a messy job and involves having the tank pumped out. This is a task normally given to the oil supplier. If your heating system is inexplicably expensive to run, getting your oil tank checked may reveal the source of the problem. The inefficiency of your fuel supply system probably dates back to incorrect decisions taken at the time of your oil tank installation. If you are building a new home or replacing an old oil tank, you have the chance to get your fuel efficiency on track from the very beginning. Whether you go for a plastic tank or a steel tank and whether you site it underground, in the basement or in the backyard all depends on your property dimensions. However, consult an HVAC technician to work out what is the most efficient configuration for your fuel supply. If the ideal system won't fit, try to adapt features of your property so that you have the necessary space in the right place to house that perfect oil tank. In order to calculate the proper size and type of tank for your home, you will need to make complicated calculations and refer to an oil tank chart. A qualified technician will be able to do all that work for you. When replacing an expositing tank, cost constraints may force you to retain existing pipelines, dictating the site and type of the tank you install. However, you will still have to decide between the tank material and the type of skin it has. Size matters. Get your oil tank installation right and you are halfway through the battle for efficient heating. Oil tank removal is a complicated task and is unavoidably messy and expensive. Getting a buried tank out requires diggers and a winching system or even a crane. Some indoor tanks are actually built in. In some cases, alterations to the building after tank installation may make it impossible to get out. Cutting up a metal tank with traces of oil in an enclosed space might not be possible. It could be that the only way to get it out is to bash out a widening of a window or doorway. No one looks forward to removing an oil tank. Oil tanks usually come with a ten-year guarantee. That gives some idea of the lifetime that should be expected from them. As your tank starts to age, keep a close eye on yours once it goes out of warranty -- whether it is underground, in a basement or out in the open. If you find costs start to escalate, you may want to consider getting it replaced. The age of a tank is usually stamped on the outside. This practice started in 1998, so if your oil tank has no date, it could be 17 years old or more. The dealer that sells you your new tank will probably be able to offer you a package price that includes removal of the old tank and installation of the new one along with the purchase price. No two tank sites are the same, so there is no standard price for removal. 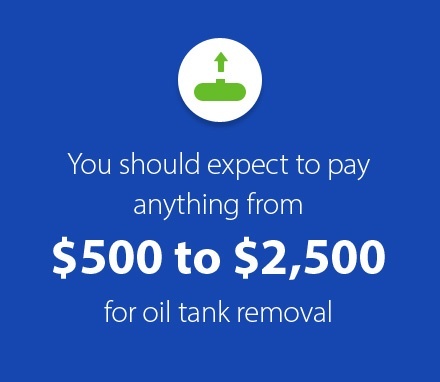 However, you should expect to pay anything from $500 to $2,500, and the oil tank company will have to visit the site before they can give you a quote. Finding and installing your oil tank yourself could prove to be a costly mistake, even if you are very good with your hands. A common error is to opt for a good price on a tank and then install it outdoors, without realizing it was cheap because it was only meant for indoor installation. An indoor tank will deteriorate rapidly in an outdoor site. Be very careful to check the manufacturer's specifications of the oil tank before you buy it. Cutting out testing and maintenance checks is a false economy. 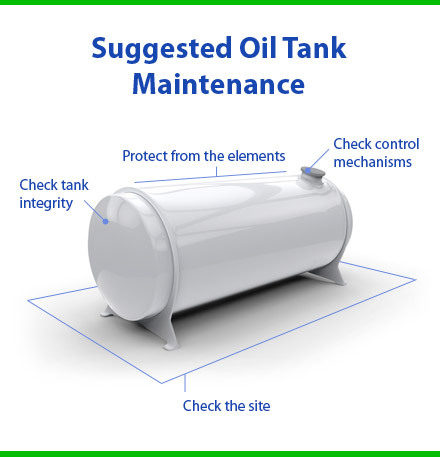 If your oil tank is still within the warranty period, you are missing out on the chance of getting a free replacement tank if you don't hold an inspection and spot flaws in your current tank. If you have an old tank, failure to keep an eye on it could result in spillages leading to fire risk and environmental damage. Taking a holistic approach to your oil-fired heating system is a good idea. However, the oil tank is a particularly critical element of that system and demands extra attention. A store of flammable liquid is a danger, and so the failure of your oil tank could be fatal. Don't risk the consequences of cutting corners on your oil tank maintenance. The site, design, fabrication materials and state of your oil tank are each important factors to take time over. Money spent on proper installation of your oil tank is not money wasted. Contact us to organize guaranteed supply, expert tank removal and installation and set up a maintenance contract with periodic inspections. Get your oil tank properly looked after and you can rest assured without the worry of what might go wrong. Once you place your trust in expert technicians, you remove a lot of responsibility from your own shoulders. Is the Cost of Oil Tank Maintenance Worth It? New oil tanks are expensive: The cost of a new oil tank can easily run into the thousands of dollars, particularly when installation expenses are involved. For this reason alone, you'll want to make the most of your existing unit. Maintenance is the best way to do this. A thorough inspection from a home heating professional can find rust, leaks and other potential damage before it affects the integrity of your tank. A small repair today can save you hundreds in oil tank costs later! Fuel oil is expensive: We all know the price of fuel for an oil tank is unpredictable in the best of times. If your oil tank isn't property maintained, stored fuel can leak out, requiring more frequent refilling. As well, if you can't accurately estimate when you are due to be topped up, the risk of running out of fuel is increased, which can necessitate an emergency delivery — another expensive proposition. Environmental liabilities are no laughing matter: One thing many homeowners don't factor into the price of an oil tank replacement is that, in many areas, you can potentially be subject to fines if oil has leaked into the ground surrounding your tank. As your homes ages, the cost of a new oil tank will eventually be an unavoidable expense. By keeping an older tank in leak-free condition with regular maintenance, you may be able to avoid an unpleasant surprise when replacement is necessary. Given current oil prices, tank maintenance is an expense that's worth it. Ultimately, the small cost of oil tank inspections and repairs is just part of being a responsible homeowner.